Michael Moore specializes in representing physicians, medical groups, medical imaging centers, and other healthcare providers throughout California. 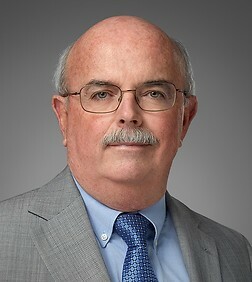 His practice includes: mergers and acquisitions, organization and implementation of multi-specialty medical groups and physician networks, negotiation and development of integrated delivery systems, affiliations with hospitals and healthcare systems, negotiation and creation of medical practice foundations or MSO relationships, development of ambulatory surgery centers AND medical imaging joint ventures, and re-structuring existing relationships. Mr. Moore serves as general counsel to several large, multi-specialty medical groups in both Northern and Southern California, and also serves as general counsel to some large radiology groups, several medical imaging centers, and hospital based physician groups. He routinely advises clients on a wide range of healthcare issues, including the Stark Law, fraud and abuse, Medicare compliance, negotiating and structuring joint ventures, and contracting issues. A frequent lecturer on healthcare topics, Mr. Moore is also a member of the American Health Lawyers Association and the California Society of Healthcare Attorneys. Mr. Moore is Of Counsel based in the San Diego office, and works for clients throughout California, and in several other states. Mr. Moore’s practice is focused on representing healthcare providers in business transactions, and providing ongoing, day-to-day operational advice and legal support. He has substantial experience in the legal issues, business issues, and professional relationships that arise in medium and large sized medical groups, as well in physician-hospital relationships. Currently representing a 140 physician multi-specialty medical group in Northern California in renegotiating its professional services agreement and compensation methodology with a statewide healthcare system. Currently representing a 120 physician medical group in Southern Orange County, California, in negotiating and restructuring its professional services agreement and compensation relationship with a large medical foundation affiliated with the Providence Health System. Represented with a statewide healthcare system to redesign and restructure its employment agreements and compensation methodology for its 500 physician affiliated medical group. Represented 60 physician hospital based single specialty medical group in Northern California in renegotiating its professional services agreement with a large medical foundation. Represented a 425 physician medical group in the Sacramento area in negotiating and restructuring certain elements of the compensation methodology contained in its professional services agreement with a statewide medical foundation. Represented a 350 physician medical group in Orange County, California, in negotiating and restructuring its relationships with a large health system which consolidated with the Providence Health System. The transaction involved modifying the governance of the medical foundation, renegotiation of the master Affiliation Agreement with the new consolidated health system, and renegotiation of the group’s professional services agreement with foundation. Represented a 125 physician multi-specialty medical group in San Diego in renegotiating its professional services agreement compensation methodology with a medical foundation. Represented a 50 physician multi-specialty medical group in Central California in negotiating an affiliation with a local hospital and creation of a tax exempt medical foundation. Transaction involved negotiation of foundation structure and governance; negotiation of long term professional services agreement between the medical group and the foundation; recruitment guarantees to facilitate growth of the medical group; sale of tangible assets and transfer of non-physician staff to foundation; long term lease to foundation of 100,000 square feet of medical office buildings and a four acre medical campus. Represented a 350 physician medical group in the Sacramento area in negotiating and restructuring its professional services agreement with a medical foundation affiliated with a multi-state non-profit health system. Facilitated, negotiated, and completed the merger of a 250 physician multi-specialty group in Orange County, California, by merging a 70 physician medical group into a 180 physician medical group. Represented the merged group in negotiating and restructuring its professional services agreement and strategic affiliation with a medical foundation and large non-profit health system in Orange County, California. Represented a multi-specialty medical group in Northern California in renegotiating and renewing its professional services agreement with a medical foundation. After his admission to the California Bar in 1974, he served for three years as a tax attorney in the Office of Chief Counsel of the Internal Revenue Service in Washington, D.C. From 1977 to 1980 he was a Trial Attorney with the Office of District Counsel of the Internal Revenue Service, in Richmond, Virginia. In 1980 he returned to San Diego and joined the law firm of Harrigan, Ruff, Sbardellati & Moore. In April 1999, he moved his practice to Sheppard, Mullin, Richter & Hampton. Mr. Moore has given programs on integrated delivery systems, physician integration, mergers of medical groups, fee splitting, Medicare fraud and abuse, the Stark Law, and the Medicare Anti-Fraud and Abuse "Safe-Harbor" Regulations.